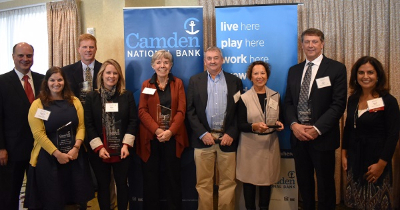 For five years, Camden National Bank has presented Leaders & Luminaries Awards to recognize outstanding board leadership, dedication, and passion in the Maine nonprofit community. Since the grant program’s inception in 2011, Camden National Bank has given $107,000 in Leaders & Luminaries donations to 31 Maine nonprofits through its private charitable foundation, The Bank of Maine Foundation. This year’s award winners are board directors for Area Interfaith Outreach (AIO), Camp Sunshine at Sebago Lake, Inc., Junior Achievement of Maine, Sarah’s House of Maine, Susan L. Curtis Foundation, Maine School Garden Network, and Sea Change Yoga. Dan Shaw, Camp Sunshine at Sebago Lake, Inc. – Chair of the Capital Improvement Committee, Dan brings strategic vision, inspiration, and financial sustainability to Camp Sunshine. A business owner of Shaw Brothers, Dan taps into his business and financial expertise in addressing infrastructure issues and facility expansions at the camp, which provides hope and joy to children with life-threatening illnesses. Dan brings a winning combination of creativity and resourcefulness to the work and mission of Camp Sunshine. Don Foerster, Susan L. Curtis Foundation – A volunteer of 25 years, Don has served as both Vice Chair and Chair of the board at the Susan L. Curtis Foundation, which ensures that economically disadvantaged Maine youth develop character, self-confidence, and essential life skills. Throughout his time on the board, Don has made important changes to the board structure, committee process, bylaws, and organizational assessment in order to ensure sustainability and progress for the organization. Guy Langevin, Junior Achievement of Maine – Having served as a Director, Secretary, Vice Chair, and Chair throughout his tenure, Guy is a compass and guide for J.A. of Maine, which delivers hands-on programs to kindergarten through 12th grade students to teach workforce readiness, entrepreneurship, and financial literacy. A strategic, forward-thinking leader, Guy was instrumental in restructuring the board and engaging Maine’s business community in J.A. of Maine’s work and mission. Judith Collier, Sarah’s House of Maine – As a professional fundraiser on the Board of Directors, Judy secured the necessary financial and volunteer support to open Sarah’s House, a cancer hospitality house for patients and families traveling long distances for cancer treatment. Thanks to Judy’s coaching, board expertise, and deep passion for the mission, she helped make 24-year Sarah Robinson’s vision come to life after Sarah, diagnosed with a brain tumor in 2010, passed away. Today, the house serves patients and families in need—it would not have been possible without Judy’s commitment and expertise. Melea Nalli, Sea Change Yoga – Co-Founder and Board Vice President, Melea tapped into personal passion, nonprofit expertise, and her professional background in order to establish Sea Change Yoga in 2015. With nearly 24 teachers and 20 yoga classes each week, Sea Change Yoga brings the healing power of trauma informed yoga and meditation to help those in prisons, addiction treatment facilities, community rehabilitation centers, and halfway houses. Michelle Erhard, Maine School Garden Network – Shortly after joining the Board of Directors two years ago, Michelle was asked to serve as interim chair during a time of need. Bringing dedication, passion, and strategic vision, Michelle helped restructure board committees and the system for board work. Michelle’s commitment of time and expertise have advanced Maine School Garden Network’s mission to support educational gardens for youth while promoting healthy living and environmental stewardship. Camden National Corporation (NASDAQ:CAC), founded in 1875 and headquartered in Camden, Maine, is the largest publicly traded bank holding company in Northern New England with $4.0 billion in assets and nearly 650 employees. Camden National Bank, its subsidiary, is a full-service community bank that offers an array of consumer and business financial products and services, accompanied by the latest in digital banking technology to empower customers to bank the way they want. The Bank provides personalized service through a network of 60 banking centers, 76 ATMs, and lending offices in New Hampshire and Massachusetts, all complemented by 24/7 live phone support. Comprehensive wealth management, investment, and financial planning services are delivered by Camden National Wealth Management. To learn more, please visit CamdenNational.com. Member FDIC. The Bank of Maine Charitable Foundation, a private charitable foundation operated by Camden National Bank, has been strengthening local communities through charitable giving and partnerships throughout Maine for over 25 years. Major charitable contributions awarded through the Foundation focus on supporting the vital signs of a healthy community which include education and youth services, health and human services, arts and culture, and economic development. For more information on Camden National Bank’s philanthropic efforts, please visit here.